The Consulates are responsible for processing visas and permits for people wishing to visit their country and offer assistance and monetary help to needy compatriots or other emergency. The administrative procedures that can be performed in a consular office vary between countries, so we recommend that you contact the Embassies and Consulates in Suriname and around before going to do any management. Each country tends to have a single Embassy in the host country, normally in the capital, and one or more consulates normally situated in main cities. The diplomatic mission and diplomatic agents have the privilege of exemption from all dues and taxes from the receiving country and duty-free importation of goods and articles intended for their use. They are also protected by this housing inviolability of diplomatic agents. 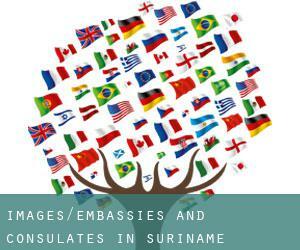 Check out the list of Consulates in Suriname and around we've collected for you. If we were unable to locate any of all Consulates in Suriname will show you the closest ones. Overview the content of this page to get the address, phone and get in touch with details of all of the Embassies and Consulates in Suriname and nearby cities. Access to this section to get a detailed listing of all Chinese consulates, embassies and representative offices located near Suriname. ConsulBy provides all Indian citizens with an updated and verified list of all Indian consular offices so they are able to make contact with them with any unexpected scenario even though in Suriname and its surroundings. Have a look using this link a collection of all US embassies and consular offices placed around Suriname, just in case you need assistance while you're abroad. Check the Nigerian diplomatic mission in Suriname, responsible for providing assistance and support to any Nigerian person whilst they are visiting the country. Access to this section for a detailed listing of all Russian consulates, embassies and representative offices located near Suriname. ConsulBy supplies all German citizens with an updated and verified list of all German consular offices so they are able to contact them with any unexpected scenario whilst in Suriname and its surroundings. Have a look using this link a collection of all French embassies and consular offices placed around Suriname, just in case you will need assistance even though you're abroad. Check the British diplomatic mission in Suriname, responsible for delivering assistance and support to any British person whilst they're visiting the country. Problems with Suriname authorities? Contact promptly with any in the diplomatic missions borwsed for Paramaribo to locate the right solution using the local authorities. One on the busiest centers of population Suriname is, devoid of any doubt Moengo with 7.074 inhabitants, making it a great candidate to host a single or extra Embassy in Moengo. We have classified all embassies by nearest town. Given that Mariënburg is one of the six largest cities of Suriname, with approximately 4.427 inhabitants, it's most likely that hosts quite a few consulates. Diplomatic missions are usually in populations with greater number of inhabitants. With 13.143 residents Suriname is one of the most influential centers of population Suriname. It is just about impossible to visit Suriname bypassing Lelydorp (with 18.223 inhabitants). ConsulBy currently has an in depth catalog of Embassy in Lelydorp and surroundings. Problems with Suriname authorities? Contact promptly with any of the diplomatic missions borwsed for Wageningen to find the very best remedy using the local authorities. The embassies and consulates located in Suriname and exist to help their compatriots to solve any problem as if they had been back residence. Adhere to the link to see all Consulate in Nieuw Amsterdam and its surroundings. It is almost impossible to visit Suriname bypassing Albina (with 3.985 inhabitants). ConsulBy currently has an extensive catalog of Consular Office in Albina and surroundings.